The Houston Rockets don't want to meet the New Orleans Pelicans in the playoffs. Every team is dangerous in their own right, and the Pelicans are, of course, not the scariest team in the NBA. They are, however, a nightmare matchup for the Rockets. That the Rockets came within a hair's breadth of winning a game they were down 21 is impressive in its own way. What we've learned, tonight, is something we already knew: matchups matter in the NBA. Chris Paul and Eric Gordon, both previous members of the franchise they played against, had the big games of the night for Houston. Paul had 38 points on 58% shooting to go with 8 assists. Gordon had 27 points on an unbelievable 10-15 shooting night, including a paid of back-to-back 30 footers. They both played like they were still on the lease, and it was a sight to behold. Unfortunately for them, DeMarcus Cousins and Anthony Davis were also sights to behold, and they combined for 42 points on 32 shots as well as 16 assists and 23 rebounds. 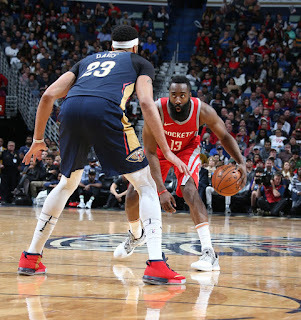 This two-headed giant, combined with sneaky good shooters around the arc, are why the Pelicans pose such a threat to the Rockets. Even with some late game heroics from James Harden and Chris Paul, it wasn't quite enough. The Houston Rockets don't have a lot of weaknesses, but there's one that glares in particular. Their frontcourt is thin, and moreover, not as well-rounded. Clint Capela is fantastic, but he's not able to defend both Cousins and Davis at once, least of all with their skilled interior passing. On the other end, he can't keep up with their versatile, complete offensive games. Nene and Tarik Black need not apply. Ryan Anderson, with his inability to defend at the necessary level, is unplayable against the Pelicans. The only other option is to go small, which is effective on the offensive end but leaves the Rockets vulnerable to the two giant bullies down low. If the Rockets have a shooting lull, like the middle of the game tonight, they will fall behind. If their defense looks sloppy, as it did tonight, they will fall behind. Between these two factors, the Rockets managed to go down by 21 in the third quarter and still tie the game repeatedly in the waning minutes when the shooting snapped back into form. In short, this is not a team that would be favored against them in the playoffs, but a team that poses a real shot at making them sweat out a long series, and even outright win one team or the other went hot or cold at an inopportune time. This was a close game, and this time the coin came up Pelicans. It's a tough loss, but when you get down 21, a close loss is more than you deserve. The real shame of this game was that DeMarcus Cousins went down with an unknown injury in the final moments of the game, falling to the ground and holding his leg after no contact. That's always scary, and everyone should hope he will avoid a serious injury. We all root for different teams, but we can all root against injuries.